This past month the City of Austin was placed under a boil water notice for the first time in its history. Flood waters of tremendous proportions from the Llano River barreled through the Highland Lakes’ system of dams before making their way, eventually, into Lakes Travis and Buchanan– the region’s water supply reservoirs. Copious amounts of silt and debris from the flood waters accumulated in these reservoirs overwhelming the water treatment plants and rendering them unable to produce water at a sufficient rate. Fortunately, our dam system did a “dam” fine job of controlling the flood waters and mitigating damage, but a changing climate is sure to increase the intensity and frequency of these types of flood events. The historic flooding 100 miles upstream from Austin and the resulting drinking water crisis left many of us wondering – how did this happen and how do we keep it from happening again? Central Texas constantly wrestles with two sides of the same coin – having too much water and not having enough. Hill Country Conservancy (HCC) is tackling both of these problems through our conservation work. Flooding causes catastrophic financial and human-cost damages and is all too common in the Texas Hill Country. Although the Hill Country is a beautiful place to live, it’s sometimes called “Flash Flood Alley” because it’s one of the most-flood prone regions on the continent. Flash Flood Alley follows the curve of the Balcones Escarpment, beginning in Waco and travelling south through the Texas Hill Country to Uvalde. This area sits right under the spot where warm, moist air from the Gulf collides with cool air coming in from the North. The clash of air temperatures causes atmospheric instability often resulting in heavy rains. We are also close enough to the Gulf to get heavy rain from tropical storms and hurricanes as we did last year during Hurricane Harvey. Rain is not the sole culprit however. Central Texas consists of a karst terrain made from worn down limestone. This rocky topography exists on steep hills which funnel massive amounts of water produced by torrential rains forcefully and rapidly into the rivers below. As the water travels, land acts as a natural flood deterrent. Soil soaks up excess water like a sponge and flora such as trees, roots and native grasses impede the progress of quickly moving water and prevent soil erosion. 97% of the land in Texas is privately owned; therefore, Hill Country Conservancy works closely with private land owners and ranchers to permanently protect land in these critical areas. In urban areas, flooding is exacerbated by impervious cover (roads, sidewalks and buildings), which further diminishes the land’s capacity to slow runoff. Conserving green spaces within urban areas is a critical component of reducing runoff in areas prone to flooding. The Violet Crown Trail in Austin not only provides a higher quality of life for area residents but it is also a necessary and nature based approach to disaster reduction in Central Texas. When we watch flood waters approach the spillway on Mansfield Dam, even with four floodgates open, the magnitude and urgency of our flooding problem becomes abundantly clear. Hill Country Conservancy continually advocates for municipalities to embrace nature based solutions as an augmentation to the more traditional measures of flood mitigation like our system of dams. Recently, HCC worked with a Citizens Bond Election Advisory Task Force and other community partners for more than a year to construct then appealed to the public to adopt, ballot propositions for the recent November 6 election. Proposition C, which asked voters to approve borrowing $149 million for parks and recreation projects and Proposition D which asked to borrow $184 million for flood mitigation, open space and water quality protection were both approved by an overwhelming majority of voters. 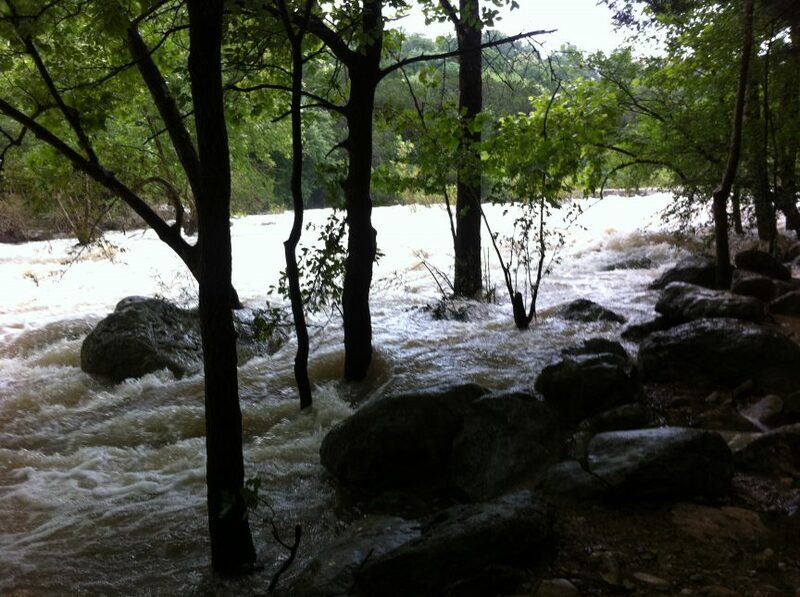 Flooding is not the Hill Country’s only problem – we are also drought prone. Our most recent drought, according to the U.S. Drought Monitor lasted 271 weeks beginning May 4, 2010 and ending on July 7, 2015. For this reason, we are fortunate to live downstream from the Llano River. The Llano River arises from two spring fed tributaries, the North Llano and the South Llano, which join together in Junction,Texas to become a river. One hundred miles downstream from Junction, the river meets Lake LBJ, the first of Central Texas’ series of water reservoirs. These reservoirs are known as the Highland Lakes and provide drinking water for over a million area residents. Even with Texas’ propensity for long and extreme droughts, in recorded history, the Llano has never run dry thanks to the many large springs that source the South Llano. The largest of these are Big Paint Springs and the more famous 700 Springs, both located to the southwest of Junction near Telegraph, Texas. Tyson Broad of the Llano River Watershed Alliance estimates that during dry periods, the springs of the South Llano provide 85% of the flow to the Llano River and the Llano provides 75% of the water flowing into the Highland Lakes. The water quality of the Llano, because it is spring fed, is exceptionally high. This bodes well for our drinking water. Fortunately, many areas around the Llano River remain sparsely populated, limiting run off from urban pollutants. Hill Country Conservancy is trying to keep it this way. By conserving land around this water source as well as around other local water sources such as the Barton Springs Edward’s Aquifer, HCC contributes to the long term viability of our most precious resource – our drinking water. Droughts and floods are just a part of life in this extraordinarily beautiful area of the country. We can’t do anything to stop them from happening. However, you can help minimize the damages caused by our local weather cycles through your support of HCC. With your help, HCC has and will continue to work tirelessly to conserve land essential to flood and drought mitigation. Together, we can make a difference.